All photos by Timo Russo. 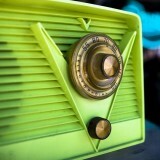 Hear his accompanying story here. 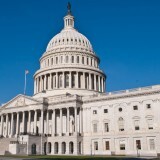 Click on any thumbnail image to launch slideshow with captions. 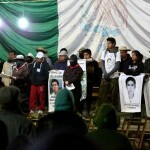 Zapatista spokesperson Subcomandante Insurgente Moises stands alongside relatives of the 43 disappeared students from the Ayotzinapa teachers’ college as he gives a speech in rebel territory on New Year’s Eve. 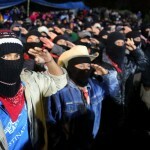 The Zapatistas celebrated the 21st anniversary of their indigenous-led uprising calling for organization and justice. 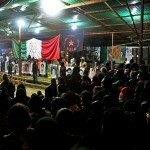 Thousands of people from around the world gathered in Zapatista territory in southern Mexico on New Year’s Eve. The empty chairs in front of the stage represent the 43 disappeared students from the Ayotzinapa teachers’ college in Guerrero. Zapatista leadership and the families of the disappeared students stand on the stage. Zapatista support base members salute the Mexican and Zapatista flags as they sing the Zapatista Anthem and bring in the new year in the highlands rebel town Oventic in Chiapas, Mexico. 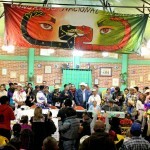 Thousands of Zapatistas and their supporters gathered in the rebel town for the new year during the Global Festival of Resistance and Rebellion Against Capitalism. 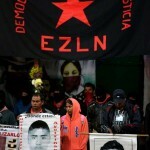 Families of the 43 students from Ayotzinapa that were disappeared by municipal police on September 26th 2014 in Iguala, Guerrero stand alongside Zapatista leadership under a flag reading EZLN (Zapatista National Liberation Army) Democracy, Liberty, Justice – during an action in rebel territory bringing in the new year. Zapatista spokesperson Subcomandante Insurgente Moises gives a hug to each of the family members of the 43 students from Ayotzinapa, Guerrero disappeared on September 26th by municipal police. 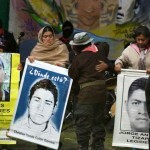 The family members of the disappeared hold banners with the faces, names and ages of their sons. 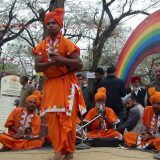 The students, who were studying to be rural teachers, ranged in age from 17 to 23 years old. 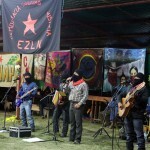 The popular Zapatista band called Los Originales de San Andres perform during New Year’s Eve celebrations in the rebel town Oventic, Chiapas. 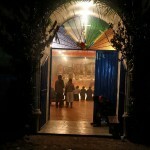 Zapatistas gather in the local church in Oventic in traditional prayer on New Year’s Eve. 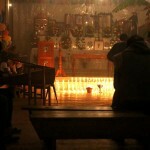 A scene from inside the Tzotzil indigenous Zapatista church in Oventic on New Year’s Eve. 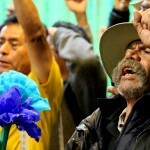 Zapatistas and Zapatista supporters huddle around candles and traditional incense staving off the highlands cold in Oventic, one of five “Caracoles” or Zapatista cultural centers of resistance. 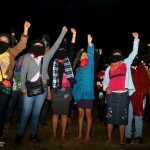 With fists in air, Zapatista women from their support base of over a thousand communities in Chiapas shouted their demand that the 43 disappeared students from Ayotzinapa be brought back to their families. 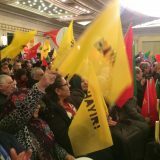 Delegates from the National Indigenous Congress (CNI) gather on the stage at the CIDECI to close the Global Festival of Resistance and Rebellion Against Capitalism. 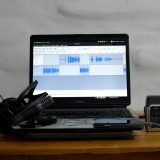 More than one thousand people from 49 countries participated in the festival that ran from December 21, 2014 until January 3rd 2015 and ended in San Cristóbal de las Casas, Chiapas. Two delegates from the National Indigenous Congress (CNI) stand before a banner that was being painted with the faces of the 43 disappeared students from Ayotiznapa represented as kernels in an ear of corn. 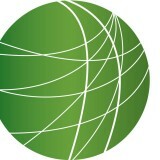 The CNI was the main host of the Global Festival of Resistance and Rebellion Against Capitalism in San Cristóbal de las Casas. 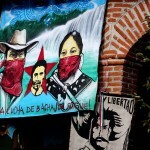 A painted banner portrays three Zapatista civilians killed by paramilitaries. 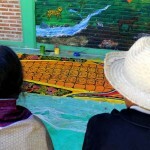 It reads “The Struggle in Bachajon Continues!” The banner was hung in CIDECI, an autonomous university for indigenous and rural peoples in San Cristóbal de las Casas, Chiapas. 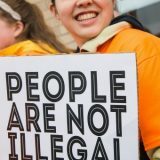 The closing events for the Global Festival of Resistance and Rebellion Against Capitalism were held at CIDECI with the participation of the families of the 43 disappeared students from Ayotzinapa and the National Indigenous Congress (CNI). 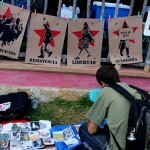 During the Festival of Resistance in San Cristobal de las Casas, a participant reads through revolutionary literature in front of screenprinted posters reading Organization, Resistance, Liberty and Autonomy — the main tenants of the Zapatista struggle. 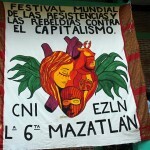 The banner reads Global Festival of Resistance and Rebellion Against Capitalism, CNI (National Indigenous Congress), EZLN (Zapatista National Liberation Army), The Sexta (Sixth Declaration from the Lacandon Jungle) in Mazatlán, one of several cities to host the festival that ran from December 21, 2014 until January 3rd 2015, ending in San Cristóbal de las Casas, Chiapas. Delegates from the National Indigenous Congress chant with fists in the air during the closing ceremony of the Global Festival of Resistance and Rebellion Against Capitalism in San Cristóbal de las Casas, Chiapas on January 3rd, 2015.